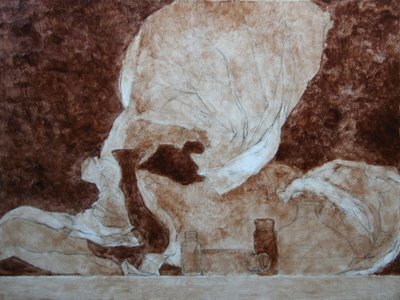 Before I began the underpainting I applied a thin layer of varnish to preserve the drawing but mostly to seal the thirsty, absorbent gesso ground. Wow, what a difference! Its is such a nicer surface to paint on, grabby but not too thirsty, silky but not too powdery. It made painting this layer much faster than usual. A reader asked me recently what I use for the underpainting. My process always evolves, but today I used Mars Red, Ultramarine Blue, and a little touch of Titanium white. I used the palette knife first to mix up a nice batch of this combination, mixing in my underpainting medium (2p linseed, 1p turp) so I had a nice big puddle of paint on my palette with the correct consistency. I tend to be against pre-mixing and I usually just dip my brush in whatever I need as I paint, and but it felt like a luxury to paint with a generous puddle and saved a lot of time, so I'll probably keep doing it. A note about materials and process: I am not a precise, materials, craft-obsessed painter. I tend to hate recipes and I get impatient with complicated preparation. However, I am finding a strange thing happening. As I get more refined in my painting I am more sensitive to materials and I am getting more and more interested in craft. I'm not generally drawn to craft for craft's sake but good materials made of simple, high quality ingredients, prepared carefully, make a huge difference for painting. I think it's possible to get distracted by materials and craft though, so the needs of the painting should drive the investigation of materials. Craftsmanship and materials should save time and make painting more enjoyable, not the reverse. I used a spray varnish called Kamar (Krylon brand of damar). It dried very fast, just 20 minutes for each of 2 coats. However, it's making the underpainting dry more slowly because it's not allowing the oils in the paint to sink into the gesso ground - which is a good thing, but I'm impatient and I like my surface to dry overnight. Its a better method in the long run though, I'll stick with it. I might have to find a faster-drying underpainting medium to compensate. ...anybody know of retouching varnish?..I enjoy your blogs very much also! Here's a good description of http://www.trueart.info/oil_varnishes.htm" REL="nofollow">varnish and retouch varnish. Dierdre I don't use any spotlights, I only paint by daylight. But you can use anything to light your subject, try different lights to get the color and shadow you like. The more difficult thing is lighting your easel with artificial light. Use a daylight lamp for artists only. And even those are not so great, either. The hardest part is keeping the light on your easel separate from the light on your subject.